The North Carolina Constitution delegates a specific power to the Attorney General with regard to district attorneys and appellate work, but the General Assembly passed a bill last week to diminish that power and Gov. Roy Cooper signed it into law today. Senate Bill 582, a technical corrections bill, contains a lot of different provisions that accomplish numerous goals, but the one that targets Attorney General Josh Stein clearly contradicts Article IV, Section 18 of the state constitution. Neither Cooper’s nor Stein’s offices have responded to requests about the conflicting provision. Legislative leaders’ offices, Senate President Pro Tem Phil Berger and House Speaker Tim Moore, also have not responded to a request about the constitutional divergence. Almost all Democratic lawmakers in both chambers and some Republican lawmakers voted against passing SB582. “While I strongly oppose the continued partisan attacks on the office of the Attorney General, this legislation does include some important provisions. In particular, it lifts the sunset on the film grant program. The film industry creates jobs in North Carolina and we need to do more to bring certainty for the companies that come to our state. In addition, the legislation provides at least a temporary fix to the school principal pay problem. We need a permanent fix to attract and retain great principals. 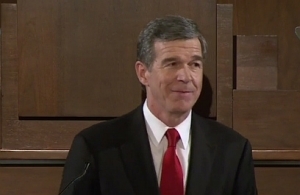 Cooper also announced today that he vetoed SB656, which eliminates judicial election primaries next year and changes the definition of a political party. GOP lawmakers have said the measure will give them more time to redistrict judicial voting maps and it is thought to be the first step toward a “merit-selection” process.